The Nokia N96 and several other Nokia Mobile Phones was introduced at the recent Mobile World Congress in Barcelona. We also got a glimpse of several other mobile phones from different manufacturers but today, we’re going to take a look at the Nokia N96. The Nokia N96 combines the looks and design of the Nokia N80 and Nokia N95. The Nokia N96 got its face from the Nokia N80 while its dual slider function it got from the Nokia N95. This mobile phone is heavier and larger than the Nokia N95 which may be a good thing for some because it ha a more solid feel to it when held. One great improvement of the Nokia N96 over the previous N95 version is that it has a 16GB of internal memory PLUS an expandable microSD slot! That was my complaint about the previous N95 standard and 8GB model; you either have to choose whether you want a fixed internal memory or a removable one. With the Nokia N96, you won’t have to choose, you have the best of both worlds. Another added feature is an integrated DVB-H receiver so you can watch Live TV. 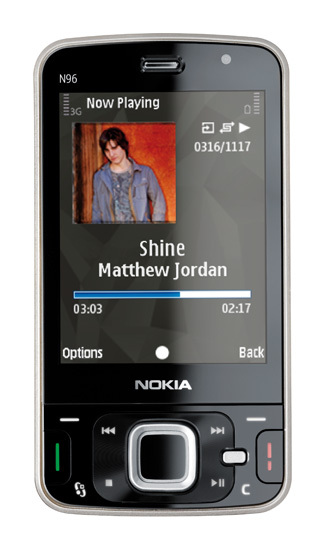 The Nokia N96 gives users a more enjoyable viewing experience. The 2.8 inch screen is large enough to watch high quality videos and the Nokia N96 can playback these videos at 30fps. What’s more, if you get tired of holding the Nokia N96 while watching videos or TV, you can place it upright on a table using the built-in kickstand at the back of the device. Other features of the Nokia N96 are just carried over from the Nokia N95 like the HSDPA, WiFi, 5 mega pixel camera with flash, GPS, Bluetooth, FM radio, etc. There’s no doubt that the Nokia N96 is very much an improvement of the Nokia N95. Nokia has enough time (more than one year) to fix the bugs and issues of the Nokia N95 and carry it over on the Nokia N96. Let’s just hope that with the added Live TV feature, Nokia has had enough sense to make battery life longer.